What is the distance? basically it has a heat pump on it that does heating and cooling of the bank and the car. just running the thing heats up the battery some the rest is powered by the battery itself using the heat pump. When its that cold the heat pump would probably be using a heating element since you can't easily exchange heat at that temperature. I think the article mentioned 120 mile range. yup not made for the boonies. You dont really hear anyone pushing for adoption in my neck of the woods either. They are made for commuters in the central band of the world which is at least 80 percent of car owners. Cant really blame them. The Volt would just switch over to its gas engine. Too bad consumers can't be bothered to buy the best engineered passenger car Chevy ever built...and now they quit making them. Par for the course. yup. The good 5hing is they will be cheap on the used market. Yes, a hybrid is a better choice, but you still have the problem of a large batt pack that can be damaged by extreme cold weather. Wonder how long GM will cover replacement parts ? $35K? That is $30K TOO MUCH! I haven't paid more for a car than $5K in the last 30 years! SAN FRANCISCO – Elon Musk announced Thursday he had released all of the electric carmaker Tesla’s patents, as part of an effort to fight climate change. That's actually an act of serious benevolence. Not sure it'll help much, but I think his heart's in the right place. Maybe he's doing it now because he thinks they're going belly up and he wants to deny the LBO predators the money those patents represents. that's be my guess. I'd do that. That's a really good thought. SALEM — Three years ago, in his driveway in Salem, Rich Benoit rigged some ropes and pulleys and did something that could modestly be described as a bad idea. He pulled a 1,300-pound, 400-volt battery out of a Tesla that had been underwater. And then, with no real clue of what he was doing, he opened it and tried to fix it. “Tesla’s credit profile is strained” despite two “credit-positive” factors, Moody’s writes in a new report: These two credit-positive factors are: One, the repayment of $1.15 billion in maturing convertible debt ($230 million in November and $920 million just now), thus avoiding bankruptcy. Apocalypse not now. And two, after numerous delays and manufacturing hell, being able to mass-produce the Model 3, though “well under Tesla’s original forecasts.” And in terms of the positive, that’s about it. Then the report points at the decision-making chaos at the top. 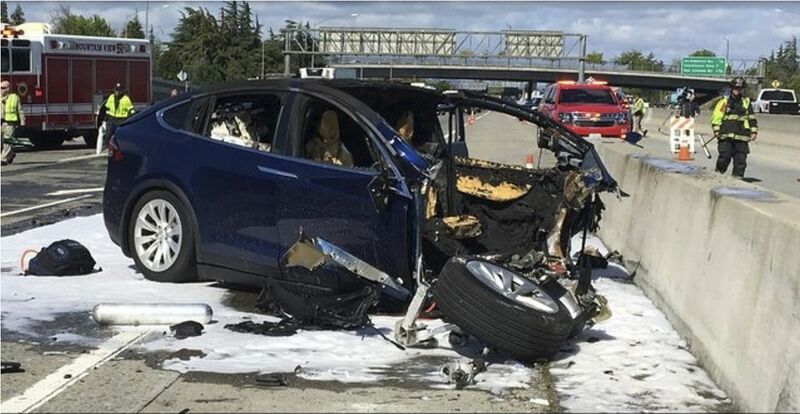 Moody’s credit rating for Tesla – B3 with negative outlook – is six notches into “junk.” A further downgrade would push the corporate credit rating into the C-range (my cheat-sheet on corporate credit rating scales by Moody’s, S&P, and Fitch). Moody’s already downgraded the $1.8 billion of 5.3% notes, issued in August 2017 and due in August 2025, to Caa1. Friday, these bonds closed at 86.125 cents on the dollar, according to FINRA/Morningstar, trading at a yield of 8.1%. There are factors outside the company too that get in the way – such as competition. It’s already huge in China, where Tesla is a flyspeck among dozens of EV makers. All foreign automakers will have to offer EVs in China. They’re investing billions of dollars in the brutal Chinese market to figure out how to profitably produce EVs at “affordable” prices. By creating pent-up demand where people waited for years, Tesla was able to sell the initial batch of these luxury cars. These high-end sales “supported the operating profit generated during the third and fourth quarters of 2018,” Moody’s writes. But to sell the Model 3 in large numbers in the US going forward, Tesla will have to bring the average selling price down to around $35,000 – and do so profitably. Tesla’s original plan called for production of the Model 3 to reach 10,000 units per week (or, about 500,000 annually) sometime in 2018 and anticipated that a low-priced Model 3 at approximately $35,000 would generate a gross margin approximating 20%. By year-end 2018, weekly production was less than half of the originally-planned rate, and stood at approximately 4,300 units. Tesla’s reported gross margin achieved the 20% target but, importantly, this margin was supported by the sale of Models 3s with an average price that we estimate was about $60,000 rather than the $35,000. Tesla has conceded that it would be extremely difficult to generate a profit on Model 3s priced at $35,000. This recognition contributed to significant shifts in operating strategy in an effort to reduce costs. So to survive its efforts to bring the Model 3 price down, Tesla undertook several erratic cost-cutting measures, and then ended up reversing them even more erratically. On February 28, Tesla announced that it would shut down most of its 106 retail stores and galleries in the US. The idea was to become largely an online retailer. This was a huge strategic move. No major automaker has yet been able to successfully switch to selling cars online only. But someone didn’t think this through. There were no negotiations going on with landlords. They heard about it in the news – and called their lawyers. Just because CEO Elon Musk, who walks on water, says so doesn’t mean leases can be broken. It’s serious money: In its annual report, Tesla lists operating-lease obligations of $1.6 billion. Of this, $276 million are due in 2019 and $257 million in 2020. Sure, it would have been nice to shed this expense, along with the other expenses associated with retail outlets, including salaries. Laying off employees is easy, but then the empty stores would still incur lease expenses. I get it. Musk announces that Tesla would close all stores, and then after the announcement, the company begins to evaluate “every single store” and checks with its lawyers, and reverses the decision. A lesser CEO who can’t walk on water would have done that before the announcement, and would have then scrapped the announcement. And it gets better, in terms of flip-flops. In February, Tesla announced its second price cut this year for its Model 3, to stimulate demand that has been waning in the US, after the pent-up demand had been absorbed. But cutting prices with sagging volume burns up cash flow in a hurry. So, on March 10, in the same blog post, Tesla does another epic flip-flop: “As a result of keeping significantly more stores open,” it would need to raise Model 3 prices on average by 3%. Then there are sudden waves of layoffs after a hiring binge, starting in the summer of 2018, including the announcement in January of 3,200-plus layoffs that included part of the Model 3 delivery team in the US. This was followed by the layoffs entailed in shutting down its retail stores, now on hold, pending further flip-flopping. Moody’s blames Tesla’s “ongoing pattern of senior management turnover and weak governance” for this decision-making chaos. Never once did it name the guy at the top. This stuff is just spam by those who want to cast aspersions on electric vehicles. It's not exactly like electric cars have a lock on spontaneous combustion. See this biased reporting for what it is....political theater.